Reach trucks and stackers is a type of material handling equipment that is specially designed to handle narrower warehouses. 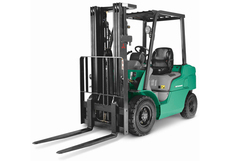 It is usually battery operated and is suitable for warehouses with narrow aisle. Order picker allows the operator to elevate together with the equipment to pick our the cargo from the racks. As a heavy machinery specialist, we have many types of heavy equipment available for various purposes such as construction, warehouse, material handling, engineering etc. We can even customize the equipment for your requirements. Just let us know your needs, and we will take care of it for you! Dowell Heavy Equipment is a forklift and heavy machinery dealer/broker in Singapore which specializes in forklift, reach truck, stacker, and other material handling equipment and heavy machinery for sale and rental. With many years of experience in the industry and an extensive network, we are able to offer you the best solutions at the most competitive price. Singapore distributor for Mitsubishi cars. We carry all major aircon brands like Daikin, Mitsubishi, Panasonic, Toshiba, Fujitsu, LG, and Samsung air conditioner. Call us for a aircon installation quote. Classifieds camper van ads, buy and sell used stuff in local Victoria, BC for free.